Transportation is responsible for nearly 15 percent of the world’s greenhouse gas emissions, and out of this, two-third is from passenger travel. Obviously, cutting down on passenger travel is good for the environment and personal health. Mass transit systems have also been proven to enhance personal opportunities, and save both families and communities money over time. In the past 20 years, public transit ridership in the U.S. is up 39 percent, but there are still many cities who haven’t tapped this valuable resource. Here is how the smart city initiative is making a difference, strengthened by several other mass transit success stories from around the globe. The Smart Cities Council outlined eight elements that make up a “smart city.” These are buildings, government, energy, health care, citizens, technology, infrastructure, and mobility. While all of these factors are important, the areas in which many communities struggle the most is with infrastructure and mobility. Modern mass transit systems are costly endeavors and are something that too many communities put off until populations reach critical mass. When a city does invest in a mass transit system, they often don’t make adequate plans for the future, creating additional infrastructure problems. To address some of these design concerns, the U.S. Department of Transportation (DOT) launched a “Smart City Challenge” or competition among some major U.S. cities. Through this unique Smart City Challenge, medium-sized cities were asked to propose a detailed plan that uses smart city technology, data, and creative resources to change how people and goods within the city move. The winner of the contest would be awarded $50 million in funding to help implement their ideas. In June of 2016, the DOT announced that the winner of the challenge was Columbus, Ohio. The city’s proposal includes the use of three self-driving shuttles that link to a new rapid transit bus center. Columbus also plans to use an App and a smart card that covers both public transit and ride-sharing services (like Uber). These new systems will open up services such as jobs and healthcare to areas of the city that currently have the worst access levels. Aside from Columbus’ success story, there are cities around the globe that are making groundbreaking plans for future projects and expansions. China can almost always be counted on for some unique ideas. 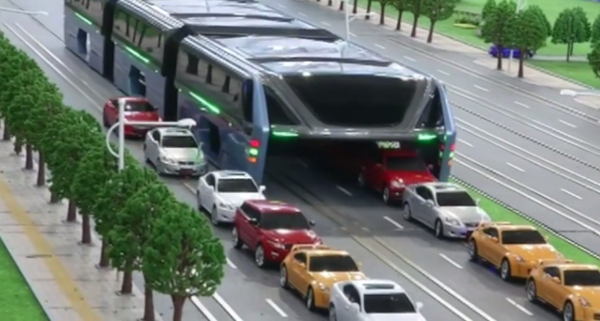 One mass transit design calls for a Transit Elevated Bus (TEB) that moves along the roads over the top of traffic. Each TEB could carry up to 1,200 passengers and would cost five times less than a subway system. In London, the London Tube is experimenting with a technology that enables them to harness the energy that it uses to slow its trains and convert it back into its grid to power other trains. This could save the city over $9 million a year. London is also working on a design for electronic walkways that could replace some Tube trains. These walkways would move pedestrians up to 15 mph and could carry three times as many passengers as a Tube line. While the use of public transportation is on the rise, there remains a need for innovative and functional designs of these systems in our cities. Fortunately, initiatives such as the Smart City Challenge are making significant inroads in the U.S., and we are seeing some exciting projects for the future of mass transit around the globe.